I am an electronic engineer by education. I spent my early work life building and launching rocket payloads as a civilian contractor (Rocket Scientist) for the US Air force. I spent 25 years as a technical sales manager for a variety of companies mostly in the high tech and semiconductor areas. I finished my career as a business consultant training managers in the ways of maintaining client relationships and using software to accomplish this. I have spent many years as a volunteer in nonprofit organizations. I specialize in training adults in leadership techniques, training methods, and presentation skills. Since retiring 6 years ago I have transitioned my woodworking hobby from furniture making to specializing in turning. I am hooked on segmenting largely because I don’t like to color wood. I am attracted to the beauty of the grain as it appears naturally. Segmenting allows me to do this and still create designs by using different species. 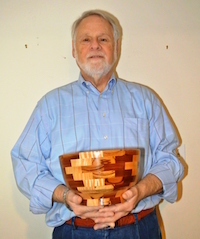 I am a Board Member of the Segmented Woodturners Chapter of the AAW and I serve as a moderator of our Forum. I regularly contribute to the Forum and I organize our annual Holiday Exchange.